Once a candidate accepts a job offer and signs on the dotted line, a whole new phase of the recruitment process begins (one that is crucial to the success of the hire) – preboarding. In many cases, the new employee will be required to serve out their notice period at their previous job, meaning there could be a period of several weeks between when they accept the offer and their official start date. This time period can either make or break the engagement of the employee – they will continue to be excited about their new role in your company or start second-guessing their decision and considering other options. 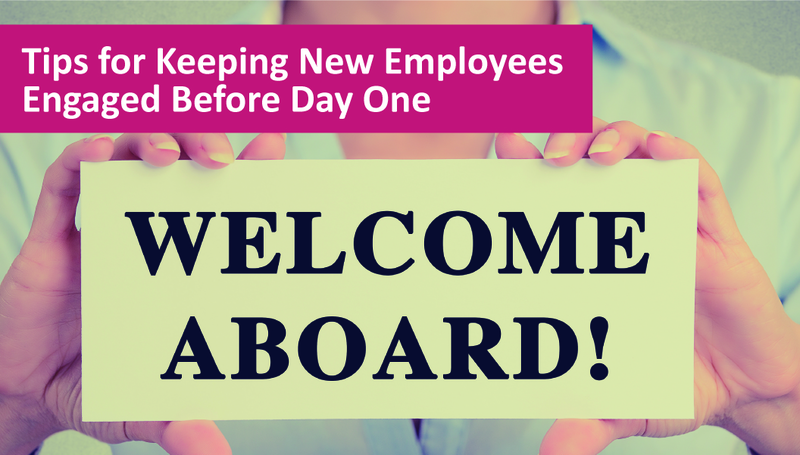 With this in mind, we’ve put together a preboarding checklist to help you get off to a good start with your new hire and ensure they’re engaged before day one. Starting a job and meeting new people can be extremely nerve-wracking, so to alleviate some of the anxiety, we recommend inviting your new hire to an event such as a company social, Friday drinks or even an organised lunch or coffee catch up with the team. Social events are fantastic opportunities for a new employee to become “part” of the team before their official start date. This will also be a great chance for them to build crucial bonds with their new colleagues and managers, making their first day more relaxed and helping them to integrate successfully. Occasionally distance can be a problem, as some new employees will be in the process of relocating across cities or countries. Where time differences and schedules allow, another option is to organise a Skype or Zoom chat with the employee and the team to give them a chance to get acquainted. A lack (or breakdown) of communication during any stage of the recruitment process could cost you a great candidate – and even more so during preboarding. While you do not want to bombard your new employee with unnecessary information, it can be helpful to email them any useful material in the lead-up to their first day, such as organisational charts, relevant company information, a copy of their job description and resources that will set them up for success. Another option is to send them a welcome pack along with their contract, containing company-branded gifts such as pens, water bottles or mousepads. It will also be beneficial for the new employee to get up to speed with communications within the team, so, where appropriate, consider adding them to the company’s group chat and include them in any “need to know” team emails. Keep the communications relevant and insightful – just enough to give them a glimpse of what they can expect when they start work and what projects they will be involved in. One of the most valuable pre-joining engagement activities to consider is including the new hire in team training days or activities. This should not be considered as onboarding or a standard induction (which the new hire will complete once they start) – rather, it is a chance for them to be part of any professional development that the team takes part in, such as a webinar hosted by a team member, formal team training on a new piece of technology or an IT industry event. Keep in mind that while they are still working in their previous role, their time may be limited and they may not be able to attend. At the end of the day, it’s the thought that counts, and the gesture will show that you are committed to investing in their growth and development. Finding a great candidate who ticks all the boxes in the IT and technology market is like finding a needle in a haystack, so it is crucial that the new hire is kept “warm” between the time they accept your offer and their official start date. When preboarding is done correctly, you are not only setting your new hire up for a successful start in their new job, but setting up the company and the team for a long-lasting relationship that will benefit everyone involved. For more information on preboarding best practice or support with navigating the IT recruitment process, contact the team at Sourced.